This IBM® Redpaper™ publication provides a brief overview of cloud technology, and describes how, from a user perspective, IBM SmartCloud™ Entry can help you access the benefits of the cloud. In particular, the product provides a comprehensive cloud software stack with capabilities that you otherwise might need to purchase separately as multiple products from multiple vendors. Businesses with an existing virtualized platform (IBM Power Systems™ with PowerVM® or IBM System x with VMware vSphere) can be transformed to a private cloud. IBM SmartCloud Entry makes this transformation possible. IBM SmartCloud Entry integrates with the IBM PureFlex™ System, so that clients with PureFlex System can also experience easier cloud-ready deployments. IBM SmartCloud Entry adds a self-service, user portal, and basic metering to your existing virtualized platform. Overall, IBM SmartCloud Entry delivers improved service levels and fast time-to-value results for receiving the benefits of a private cloud infrastructure. The four use cases demonstrate how easily IBM SmartCloud Entry can be deployed and the possibilities for improved efficiencies in your organization. The cases demonstrate cloud deployment in PureFlex, VMware, Power Systems and x86 environments, and a telecom company. 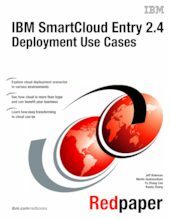 Also described are two IBM SmartCloud Entry processes, showing the ease of provisioning and installing with this product. This paper is directed at decision-makers, such as CFOs, CIOs, CEOs, IT managers, systems administrators, enterprise architects, systems architects, and IBM Business Partners. Presales and post-sales technical staff can benefit from discussing this paper with clients and potential clients.